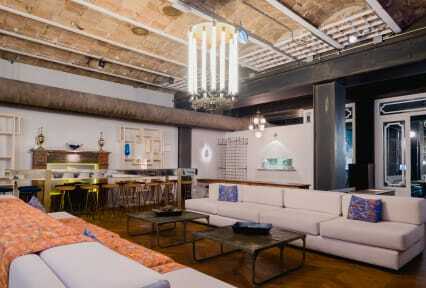 Die folgende Beschreibung ist eine automatische Uebersetzung von Casa Gracia Hostel liegt zentral im großen, malerischen und deutlich Barcelonan Straße im Zentrum der Stadt, in der Nähe von Gaudis La Pedrera, Casa Batlló und High-End-Geschäfte. Das stilvolle, sauber Boutique-Hostel ist 'auf halbem Weg vom Hotel zum Hostel, sehr poliert', gemäß unserer Anwender, die auch sagen uns, sie schätzen ihre Gemeinschaftsgefühl, mit nächtlichen Kneipentouren und Abendessen. Ein Reisender meint dies ist ein großartiger Ort, um einige lokale Tapas und erleben Sie das authentische Barcelona '. Once you come in our door, you will actually feel at home – everything is included: comfortable bed, 24 hours free tea and coffee, towels and linens, daily cleaning service, Wifi, large common areas with fully equipped kitchen, relaxing area, computer area, games plus an amazing terrace! Located in the very center of Barcelona, where two of the most important avenues meet (Passeig de Gracia and Diagonal), Casa Gracia hostel is the place to be if you are looking for an authentic experience – Gracia barrio is the perfect contact with the local culture! We host our guests both in shared and rooms, up to six people. All our rooms have en suite bathroom! We also offer nice and new apartments with the best equipment in the attached building. So you can choose whatever suites your comfort. Or your pocket! We offer 24 hours reception, we will keep your luggage wherever you want. We offer great service such as individual lockers free of charge in shared rooms, bed linen and towels included in price, laundry service and board games in the salon. Casa Gracia is much more than just a hostel. It happens that as in our homes, people suddenly hung paper, postcards, photos, paintings that we like, on the wall. We’re cooking and experimenting with different types of food, we invite friends and celebrate different events: exhibitions,concerts, dinners, screenings/projections. The young and driven crew of Casa Gracia Barcelona Hostel will be delighted to help you with useful information and tips about the city: how to get to the touristic highlights or other places you would wish to visit. Every day and week the staff will recommend you certain places, events or small curiosities that will make your visit to Barcelona unforgettable. Check-in: 15.00/ Check-out: 11.00. If you want to check in early you're welcome to leave your luggage here until the room is ready. Reception is open 24hrs. We have a 72hr cancellation policy. Cancellations must be received by email at least three days before the arrival date. Late cancellations and no-shows shall be charged the equivalent of the first night's accommodation. Reservations for more than 16 people are considered as a group, and we request a 50% non refundable deposit at the moment of booking with the 50% remaining to be paid 2 weeks before arrival. If a guest cancels prior to 3 days of their arrival date, they will be charged the first night. **Important** The deposit on-line does not apply toward the first night charge. Above all, Casa Gracia Barcelona Hostel wants to offer its guests a moment of relaxation and pure enjoyment, with spaces created to make you feel at home. From this welcoming environment you will have the opportunity to discover the most interesting places of this great city. All our rooms have en suite bathroom and courtesy amenities. Our superior rooms have balcony and view to 'Paseo de Gracia' Boulevard. Minors under the age of 18 must have an adult supervision. Only adults can be booked into a mix dormitory or female ones. 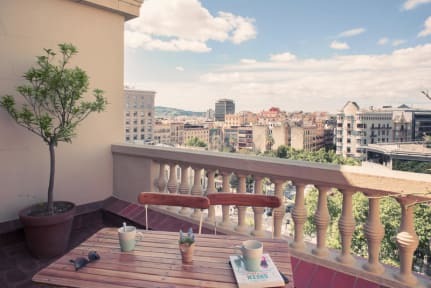 The hostel is located in a beautiful mansion, in the typical modernist style of the Eixample neighborhood. It is spacious and divided into various common areas, as there are the dining room, the salon, a big kitchen, a relax room and a big terrace. The excellent location allows easy access to the best attractions and hot spots in the city. Paseo de Gracia with the buildings of the famous Gaudi´s such as La Pedrera and Casa Milà, las Ramblas and Rambla Cataluña are a mere stone’s throw away! Casa Gracia Barcelona Hostel is at the entrance of the amazing neighborhood of Gracia, in the Jardinets of Gracia. This lively area of the city is one of the places to be for a cup of coffee on a nice terrace. Besides for its large numbers of small ‘plazas’ or squares, it is also known for its art galleries, movie theaters, restaurants, pubs, bodegas, bars and delicious ice cream bars! Casa Gracia’s new breakfast allows our guests to start their day in the best possible shape – healthy and fresh! We welcome you to enjoy our daily seasonal menu, which includes fresh fruit, juice, vegetables, eggs and homemade pastries. Bon appétit! Wir hatten ein wunderbares Wochenende in Barcelona und diesem schönen Hostel. Es liegt sehr Central und an der großen Straße. Teilweise ist der Verkehr etwas laut. Aber das hat uns nicht gestört. Die Betten waren sehr bequem. Der Service und das Personal super freundlich. Stylish interior design in a beautiful old building, very clean! Highly recomanded! Wunderschönes Hostel/Hotel! Die Ausstattung des gesamten Hostels ist wunderbar! Besonders gut hat mit das „Wohnzimmer“ gefallen in dem wir morgens eine kostenlose Yogastunde einlegen durften! Die Küche ist super ausgestattet und ein Pluspunkt: man muss nicht selbst abwaschen ;) Ich habe mich rundum wohlgefühlt! We must appreciated our stay in Casa. With the new concept it is young and meets expectations of todays globetrotter. The mix between hotel and hostel is very open minded and absolutely comfortable. The rooms have all you need (a topping would have been a little chair with table in the single rooms), they are clean and air-conditioned. The staff is super friendly and very open to everybodies questions. The location of the hostel has not to be mentioned - directly at the "Champs-Elysees" of BCN.